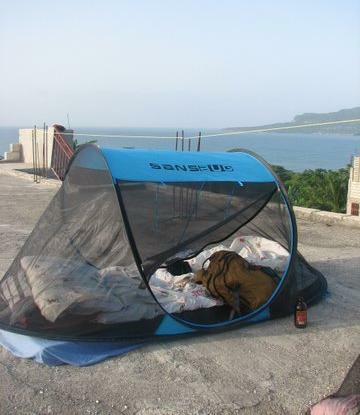 I worked in Haiti for 11 months, and slept in my SansBug mosquito net tent every day. I’ve used it on beds, grass and even concrete floors. I was working on the island of La Gonave as an Environmental Engineer, working for a DC-based NGO. I helped build treated drinking water facilities for the local communities. Being lightweight and compact, it was easy for me to take around, especially while riding on the back of a motorcycle. If people didn’t see me coming, they knew I’d passed by when they spotted the round blue bag from behind! Traveling on the airlines was even more fun – most people had to ask what it was, but one person even thought I was a circus artist of some sort! I took the SansBug as carry-on with 2 other small bags, and the airlines haven’t had much problem with me. I once had to place it in the closet space up front (where the pilots hang their coats) because it was a narrower plane and it wouldn’t be able to fit in the overhead bin. But again, the flight attendants were pretty accommodating. Sometimes it’s a tough fit for the net to fit through the security scanner, but I put it in diagonally and it usually works. Only once in Haiti it didn’t work but they removed it from the bag and patted it down so it was fine. I would recommend the SansBug mosquito net tent to anyone looking for a quick and easy set up, and a stylish solution to keeping those bugs out. Especially useful is having the all-enclosed bottom tarp layer to keep the creepy crawlers out (particularly while sleeping on the ground).